This Saturday I attended my first Radio Control Airshow. A friend of mine bought his first radio control airplane about a year ago and has enjoyed himself so much that he has practically built a full fleet with 10 aircraft. He let me know about this airshow and I knew I had to check it out. The airshow was being held by the Greater Cincinnati Radio Control Club. I did not know what to expect but was surprised by the size of the show. They basically closed down the Butler County Airport for their show, an airport my wife and I flew over just the night before. 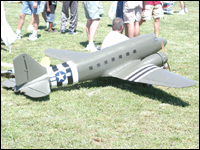 The show was taking place on the taxiway and regular traffic was asked to avoid the airport. The airshow had some wild demonstrations that included flying road signs (turn signs, interstate signs, stop signs), military replicas, planes made from foam and much more. They had mock dogfights and some amazing aerobatic demonstrations. It was fun being introduced to some RC pilots as a pilot of "full-scale" planes. I was happy to see they had a nice collection of full scale planes at the airport for viewing in addition to the RC planes. I liked the stearman bi-plane the most. I took a photo of the full-size Stearman and many of the RC planes and posted a few for viewing. I can honestly say I will visit an RC airshow again. Everyone there has a similar passion for flight and an absolute love for airplanes. It was a fun way to spend an afternoon.